Many of the restaurants in Branson always offer a wide range of dining options including fine dining, steakhouse, seafood, pizza and BBQ as well as eclectic eateries, chain restaurants, buffets and banquet facilities that can set hundreds of guests for conferences, weddings, and other special events. Whether you come for an early breakfast, lunch with friends, or a family dinner, you always expect to enjoy quality service and a relaxing atmosphere in a local restaurant that you choose. As one of the best local restaurants in Branson, Hungry Hunter is a restaurant that serves breakfast all day. Fresh homemade cinnamon rolls, homemade chicken fried steak and pork tenderloins served here are sure to satisfy your taste buds. 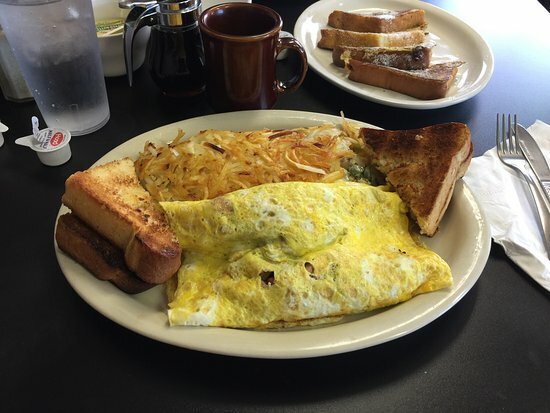 The foods at Hungry Hunter are hand cut, cooked to perfection, and you can eat some of their delicious food as a sandwich or with some yummy hash browns and eggs. They also have warm gooey cinnamon rolls if that’s what you prefer. This restaurant is the answer to many of Branson’s hungry vacationers. You’ll enjoy huge portions of incredible food prepared homestyle in a cozy atmosphere that includes a beautiful display of a train chugging around the restaurant. This might not be the place for really large groups, but this is a perfect dining spot that makes it worth breaking away from the crowd and grabbing a breakfast that’ll have you coming right back for lunch. Regular customers of the Hungry Hunter rave about Bob’s Special Hashbrowns, fried up with onions, peppers, mushrooms, Swiss cheese, and sour cream, with servings big enough that you need to share some. This restaurant is perfect spot to have breakfast as their pancakes are large for a dinner plate, and the warm cinnamon rolls smothered with icing are enormous. Lunch options are also large, and everything on the menu is served with genuine Ozarks hospitality. Their amazing Cinnamon French Toast, homemade sourdough bread, large omelets that are good for two, thick sandwiches – all this and other tasty eats await you for breakfast, brunch, or lunch at the Hungry Hunter Restaurant in Branson. Hungry Hunter is such a great little restaurant to stop by and grab some of their homemade biscuits and gravy. They have gravy that is full of little sausage pieces, so every bite you take can fill your mouth like flavors you haven’t enjoyed before. . If you can’t stop to this place early, you can come later and grab their lunch special of a Texas Twister burger or some of their pickle fries. They also have blueberry and cherry crisp. Try their French toast which is made out of their homemade bread and their bacon over medium eggs – they taste awesome. You’ll also find that their coffee isn’t overly strong like some places so it hit the spot and you’ll find the service is friendly and efficient. If you are looking for the best local restaurant in Branson to enjoy a satisfying dining experience, check out Hungry Hunter where you’ll never go out hungry.